Lilly and Doug Bedingham from the U.K. were great supporters of the Belle Vue " Aces" from the 1930s upwards and collected Speedway photos and memorabilia of that era.. Their son Graham has seen fit to share some of the the great photos his Mum and Dad collected over those years with us on "JustSolos"........Thank you, Graham. Classed as one of the "all time greats" Aussie,Vic Huxley. 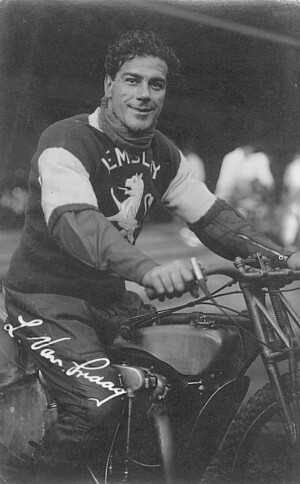 The first ever World Solo Speedway Champion, Lionel Van Praag poses in his Wembley team jacket. 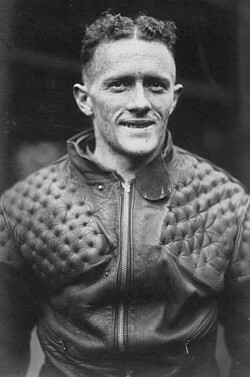 American Solo ace of the 1930s, "Cordy" Milne. 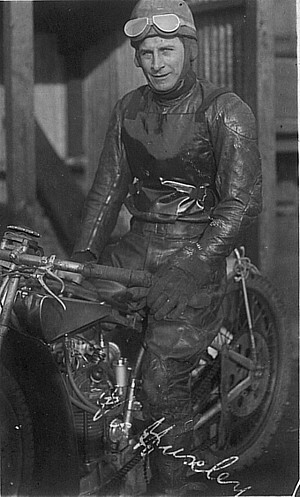 Cordy rode in Australia in the early days. 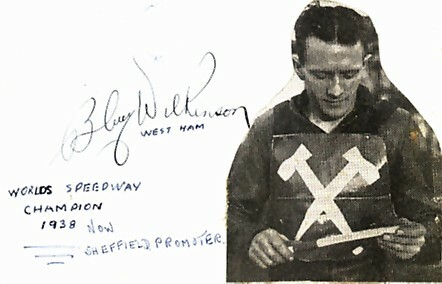 He was placed 4th in the inaugural World Solo Championship at Wembley in 1936, 3rd to his brother Jack's 1st place in 1937 and was placed 6th to Jack's 2nd place in 1938. 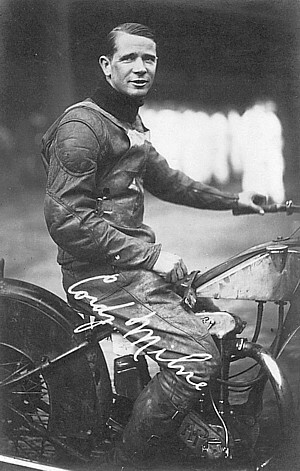 A great study of 1938 World Speedway Solo Champion, Arthur George "Bluey" Wilkinson. How about those leathers !. 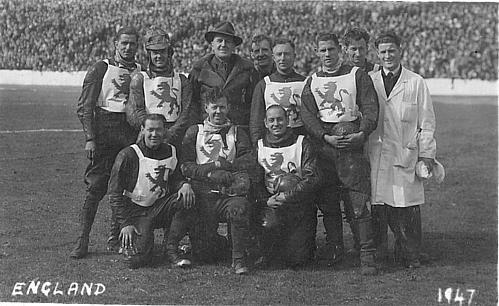 A 1947 Australian Touring Test Team in England..
Aub Lawson, Max Grosskreutz, Bill Longley, Johnny Hoskins, Lionel Van Praag, Frank Dolan, Ray Duggan, Vic Duggan and Doug MacLachlan. L to R. Back Row. 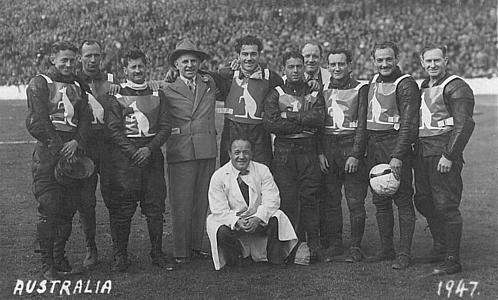 Norman Parker, Alec Statham, Alec Jackson ( Manager ), Oliver Hart, Bill Kitchen, Tommy Price, Ron Clarke. Les Wotton, Jack Parker, Malcolm Craven. It appears that this was the 1st Test at Bradford on 5th July 1947. The crowd was 47,050 ( not bad ! ) England won 65 to Australia's 43. The only thing that doesn't add up was that Ron Johnson isn't in the photo and Doug McLachlan is, but according to the records Doug did not ride in this Test and Ron did. How about this for a bit of Belle Vue "Aces" Speedway Memorabilia.? A Belle Vue "Aces" club badge with bars from 1937,1938, 1939, 1946, 1947, 1948, 1949, 1950, 1951 and 1952 ! What a top photo ! This is when riders were actually mates ! 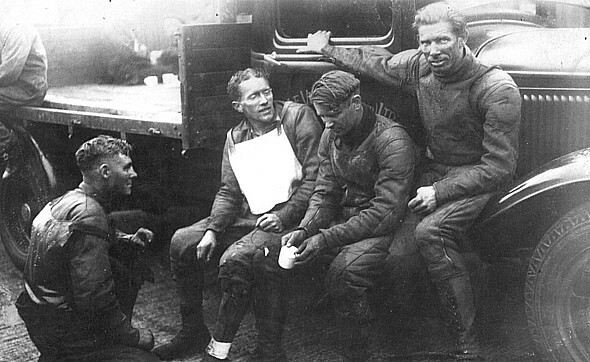 Phil "Crash" Bishop, "Bluey" Wilkinson, "Cordy" Milne and brother Jack Milne. 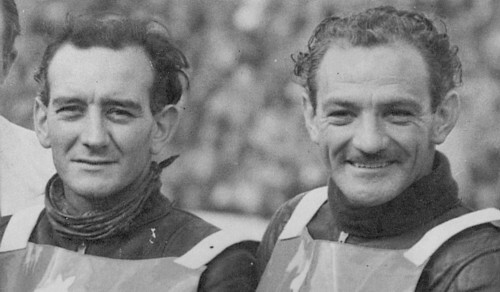 Ray Duggan on the left with big brother Vic. Ray lost his life at the Sydney Sports Ground Speedway on the 20th January 1950 in a dual fatality crash which included his mate Norm Clay. .